Thanks to www.bigfoto.com for the images! When I had to go back to Vienna last December, I was really looking forward to it. I hadn't been there in about 15 years, and when I was told I'd be visiting this fascinating city, forgotten sights and smells jumped right back, front-and-square into my imagination. 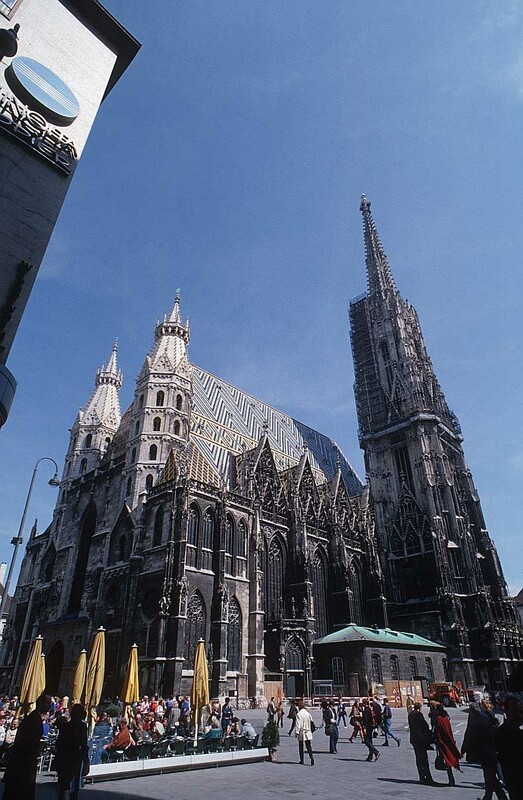 Vienna, like all great cities, has its own character. And Vienna is a sweeping, elegant stage, hastily abandoned by a show that has long ago left town. The city is full of the pomp, the glory of imperial power. But the empire, the power, evaporated when the Habsburgs were driven from the throne of the Austrian-Hungarian empire at its collapse in World War I. That was a hundred years ago. And ever since then, the city has had trouble thinking of anything useful to do with its vast array of monumental buildings. The city is full of of them. You'll run past a huge museum, a theater or a palace every half a minute, way more than a city of its size can use for anything practical. In other words, Vienna is all dressed up with no place to go. But people still enjoy play-acting on this grand stage, full of coffee houses, operas, concerts, universities. We'll start in a square on the edge of everything and zig-zag a bit through some of the most interesting parts of town. The tour begins at Karlsplatz. 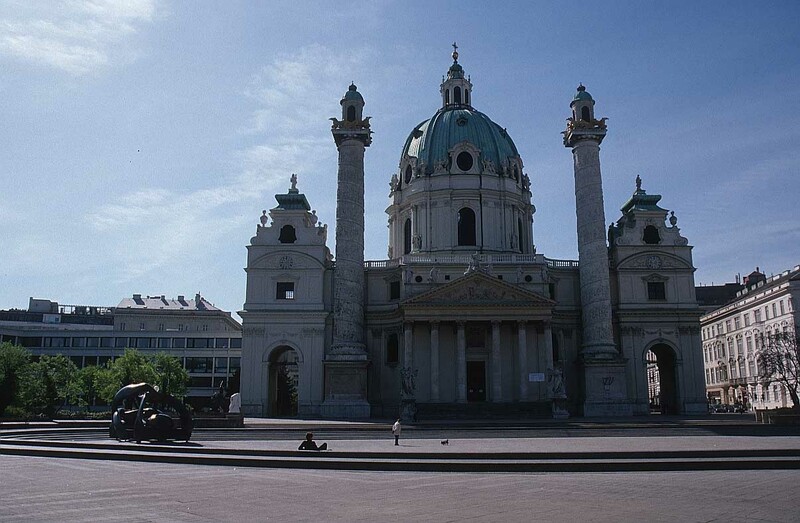 The square is dominated by the huge rococo Karlskirche (church of St. Charles). But the really interesting stuff, I think, are the art nouveau subway station in the middle of the park, and the art nouveau Secession building at the west end of the park. 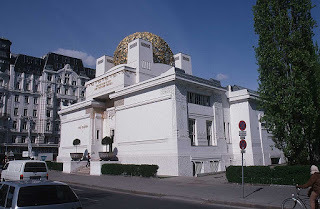 So let's take a quick look at the church, flanked by its Trojan's-Column-style towers, then jog by the Stadtbahn station in the center of the park, and then run westwards towards the Secession building, with the golden sphere on the roof. It might look familiar: the Secession is pictured on the Austrian 20-cent Euro coin, and seems a bit small for its grand design, when you get up close. 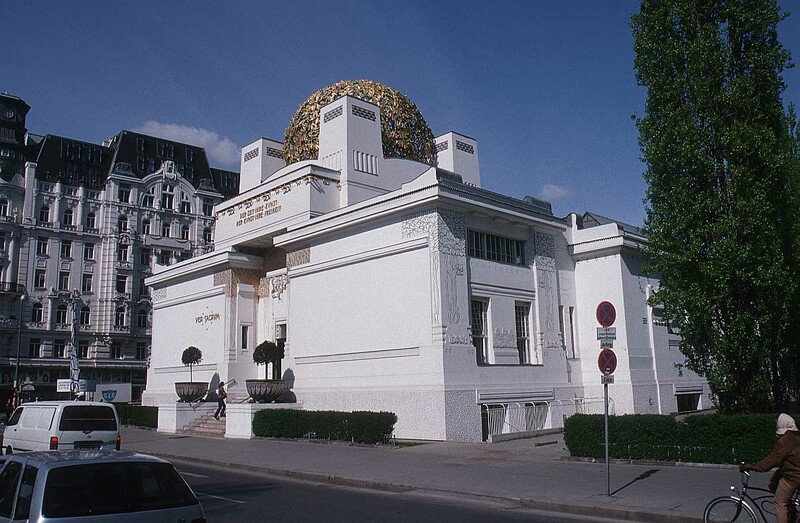 It was built as the exhibition hall for the brilliant but short-lived Viennese art nouveau scene just before World War I. We'll run past the Secession and curve towards the left on Friedrichstraße just a hundred meters to the Naschmarkt, which you'll see straight ahead, full of market stands. This long market is full of delicatessen food stands, and is a good spot to come back to eat later. Do a loop through the market and run back towards the Secession, but then turn left just before getting back, going west on Getreidemarkt. 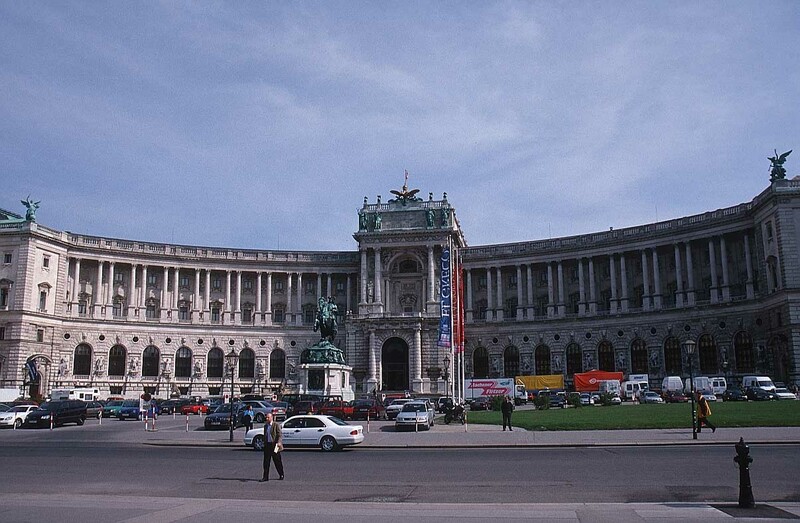 At Mariahilfe Straße, you will see several big museums ahead. We'll come back here soon, but first we'll turn left and go uphill on Mariahilfe, Vienna's main shopping drag. Run a few blocks till you see the rococo Mariahilfer church on the right, and turn there at Stiftgasse. After a couple of blocks, you will run right into one of the most interesting neighborhoods in the new town, Spittelberg. It has pleasant town houses lining narrow alleys, mostly fixed up and full of galleries, boutiques, pubs and restaurants, and everything with a bohemian touch. This is the way every big-city neighborhood should be. I always enjoy running up and down any or all of these wonderful alleys. When I was there in December, its alternative Christmas market was going on, full of handcrafted goods and whole foods. We'll zig-zag through it. Maybe first turn right on Siebensterngasse (Seven Star Alley), and then left on Guttenberggasse. At the end go right again and return to Siebensterngasse on Kirchberggasse. You are now back on Siebensterngasse, where you turn left and run back towards the museums we saw earlier. The street ends at Karl-Schweighofer-Gasse, where you look across the street for the steps going up into the back of the MuseumsQuartier, to the right of the little restaurant. You'll run up a walkway raised above the yards below, and come out at a big stairway leading down into the MuseumsQartier courtyard. The MuseumsQuartier was once the royal stables, a huge group of elegant buildings, now full of museums. Those were lucky horses back then. On the right side of the courtyard, you'll see the Leopold Museum, a big modern cube housing the greatest secessionist works. I don't understand why they needed to put up a new building for a museum, with all the amazing classical real estate that's hanging around town, waiting for a purpose. Run straight across the courtyard, and then out through the main building, and you'll find yourself on the plaza out front, looking out at a grand square, flanked by two more huge museums. Run straight out through the square (Maria-Theresien-Platz), and you'll come to Vienna's main boulevard, the Ringstraße. The Ring was built where the old city walls had been, and it's now lined with all the most imposing buildings in town. You're now facing the gatehouse to the imperial palace across the street, but we will first go down the street before we get closer to the palace. So turn left, coming to the Parliament on the left side, where the street makes a curve to the right. The Parliament looks like a Greek temple, lower and a bit less pompous than most of the buildings on the Ring. Right after the Parliament, a park begins, and the huge (of course) gothic city hall (Rathaus) thrones behind it. Run through the park and take a look at the main entrance and tower of the town hall. In December, this is the location of Vienna's main Christmas market, and every tree is hung full of lanterns, and the town hall windows are turned into a big advent-calendar. Run back out to the Ring, and cross the street to the imposing Burgtheater (castle theater). On the right side, where the south wing sticks out, there is an entrance into the park on that side of the street, the Volksgarten. Run through the Volksgarten (if it's open. Otherwise, you need to run 50 meters further, behind the Burgtheater and turn right on Löwenstraße and run behind the back edge of the park). We are running south, straight back towards the imperial palace. You will suddenly find yourself at the big castle square, Heldenplatz (Heroes' Square). 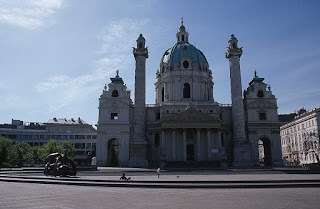 Run through the middle of the square, past the monument to Grand-Duke Karl, and run up to the curving grandeur of the youngest wing of the palace, completed just a year before the last Kaiser left the palace forever. The Habsburg family ruled half of Europe from here for 600 years, first as Kaisers of the Holy Roman Empire of the German Nation. When Napoleon overran Germany and declared the Holy Roman Empire for defunct, the Habsburgs quickly invented a new empire, Austria-Hungary, for which they could claim a Kaiser's title, and they held out for another hundred years. To the left lies a collection of earlier castle buildings. In the evenings you can often see the amazingly ornate ceilings lit up from within. There are also public concerts held here many evenings, an impressive setting, which I really recommend. Turn left and run through the main gateway into the castle courtyard, where you can easily see the various construction epochs, from medieval to baroque. Keep running out the other end of the courtyard, out through the other gateway that served as the entrance to the imperial apartments. Now, at the circle enclosing some Roman ruins, you come out into the old town, which stretches ahead in a maze of alleys down to the Danube River. Run straight ahead down Kohlmarkt until the first real turnoff on the right, the Graben. Graben is a big pedestrian street, with a rococo Maria monument (most of these were erected in thanks for plague epidemics that spared the donors) and lots of street life. 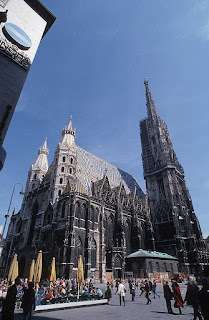 Run down Graben until it crosses the other main pedestrian street, Kärntner Straße, where you turn left and run straight to the great cathedral, St. Stephan, with its colorful zig-zag-patterned roof. When you're properly dressed, you definitely need to come back and go inside the church. Behind the cathedral, stretches the most interesting part of the old town, with small alleys full of town-palaces, chapels, monasteries and squares. We'll just run through a bit of it now, so you can get a feel for it, and come back later for a more thorough look. Run around the back side of the cathedral and keep going along Zedlitzgasse, going east. You'll pass the Grünangergasse, and just after one more building turn right into the tiny Kumpfgasse. It runs into Singerstraße, where you turn left. It soon runs into Seilerstätte, where you make a short left turn, then turn right again on Liebenberggasse. In just a few blocks, you'll cross the Ring again, going right into the Stadtpark. 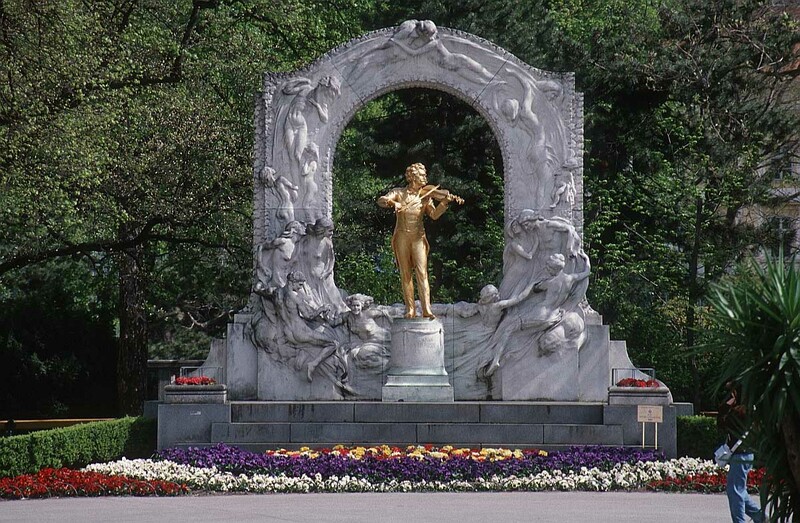 Run into the park a bit, then follow the path to the right, where you'll soon see Johan Strauß playing his fiddle (or a golden statue of him, anyway). When the park ends, just keep running up the Ring, where it will curve to the right at Schwarzenbergplatz, with a view of its palace to the left, down the road. But keep going down the Ring, past the Imperial Hotel and Grand Hotel, and you'll see the opera house coming up on your right. This is where Kärntner Straße comes out of the old town. Turn left on Kärntner, and in two blocks you'll be back at Karlsplatz. Now, that's what I call a nice route.